Well, we’ve made it – Happy Valentine’s Day! I think I squealed when I found out that Liz from So Much to Smile About lives in DC too. She’s bringing so much style to our city – it’s super exciting! This lucky girl just got back from New York Fashion Week, but she was sweet enough to put together a hot outfit for going out tonight. I love the pops of pink! Hi sweet readers! Liz here from So Much to Smile About. While I swear I do love Valentine’s Day, I’m just not a huge fan of pinks and reds – but the perfect LBD and a pop of color? That’s something I can support! So I thought I’d share with you some of my picks for adding in a bit of festive color this Valentine’s Day, whether you’re hitting the town with your girlfriends or have a romantic evening planned! OR even if you’re staying in, who says you can’t wear fabulous pink pumps around the house? Posted February 14, 2012 in Holiday by Nikki. Thanks so much for having me! You are so sweet! Happy happy valentine’s day dear!! Lovely! The LBD with a pop of color is definitely something I can get behind, too. And I’m a pink girl through and through! 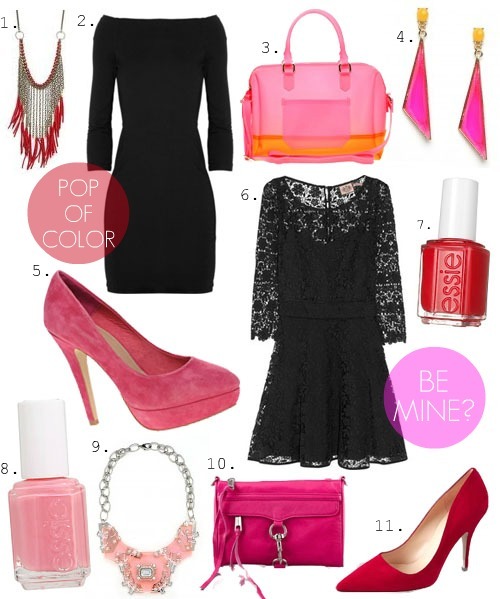 Love the idea of pairing a little black dress with pink and red pops :) So pretty, Happy Valentine’s Day! Gorgeous round up, Liz! I especially love the James Perse dress and Rebecca Minkoff bag! This series has been so much fun to read everyday, Nikki! Thanks for putting it together. I love seeing everyone’s picks! Happen to be wearing black, red, and pink right now! The perfect wearable combo for this holiday. Happy Valentine’s Day girls! Such cute picks – I love that bright pink and orange ASOS bag!